Machine rebuilding starts to wind down (not really) but enough to allow the start of machining products in a few short months. We are awarded a great achievement from a social networking group we are members of and then Patrick says he is going to expand the number of educational instruction video about how we build, rebuild, machine and finish micro-machined products and likely many other on topic videos of how to and step-by-step, we really want to share our skills or knowledge to the next generation. Machine and tool rebuilding progress. We are members of some great online communities. Educational step by step is or our first pullout video series. Welcome to the behind the senses of the filming for Shop Adventures. Shop Adventures is a weekly overview from the 186 hours of work performed each week, cut down into a video that runs from 30 minutes to 1 hour in length covering the progress of these two childhood friends who are rebuilding and refurbishing vintage micro-machinery tools and accessories for making precision machining parts. These machined components will then all come together in the making of the code named product “The Perfected Product”. What goes on behind the YouTube filming scenes is a far cry different then what actually gets filmed and then continues on to make the viewer cut. Before we begin, a reminder this YouTube weekly series is titled Shop Adventures, not hurry up get it done because we are filming and NO, that is NOT the way this operation works. We are all about the details not the time clock. We have these two Levin Lathes, one is an enclosed or boxed style head stock version from the 1980’s and the other is from the 1950’s or early 1960’s which is an open style head stock lathe. Each lathe has its lathe bed and both are the same in length. Each mounts to a Levin chip bed and then the two pieces are mounted through the maple wood table top at a precise position on the table. The motors that power these lathes are mounted behind the lathe beds to the maple wood table tops, out of the way for the daily operation while still in plain view for periodic belt tension inspections and the ability to change the belt to higher or lower speed pulley diameter setting at anytime. Placement of the Levin Lathes gets down to trial and error and alignment is key. Move the unit forward, a bit backward, some more left to right in our attempt to make the machine location the best it can be for the operator (the two of us), the comfort, ease of use and ability to last through an 8 to 10 hour day, 5 to 6 days per week, week end end and week out and finally year after year. 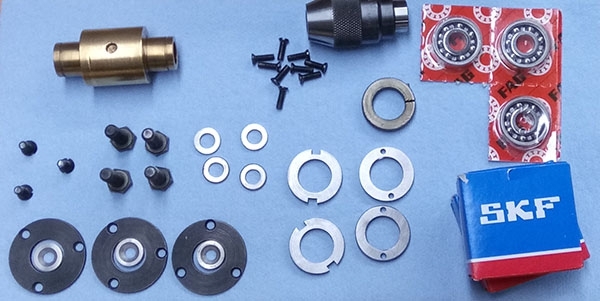 We have many Levin Lathes and even more Levin Lathe accessories, not to brag just sharing our capabilities in being able to make a lot of fine micro machined parts to most specifications. We have only 2 Levin Lathe accessories remaining, a Levin Radius attachment to be finalized and a Levin Micro Drilling attachment to get started on to be refurbished. Then all of our Levin accessories attachments will be serviced and ready to return to full operation again and by operation we mean the making of our "Perfected Product". The unofficial code name given the project we are working on and will be sharing in our video series, Shop Adventures over the coming months. Rules of Active Atom under the term machine refurbishing and machine rebuilding, are saying nearly the same thing. As far as we are concerned, if a machine is being refurbished it is getting every single thing done to it except paint. Whereas Machine Rebuilding means that the machine is getting its original paint work replaced in addition to the general refurbishing. Why not just rebuild all of the machines and tools accessories since the only difference is going to be repainting the machine or not repainting the machine? We favor originality in our refurbishing and rebuilding process because these machines might be ours for now, we are essentially caretakers for the future generations to follow. We salvage many original machinery components during these reworks except bushings, bearings, felts and common screw, bolt, nut, washers and set screws even brass spacer hardware but for the paint, if it is mostly still in tack. We do not strip it and reapply it if at all possible. Regardless of the choice to refurbish or rebuild a machine, here is what all machines and tools receive during the process. Disassembly, photographing, original parts inventory, individual part inspections, machine way inspection for wear and dimensional issues to determine the need to re-scrap the machine or tools ways, order form for parts replacement, order form for the making of a new machined component no longer available from the manufacturer or the used new old stock market. Please allow us to reintegrate that all machinery, tools and accessories receive new bushings, bearings, felts, set screws and general purpose screws, nuts, bolts, washers and brass spacers (we machine our own standoff spacers) so when a machine returns to service, it is going to last for the next 40 to 80 years following our usage. Thanks to this website, our blog, YouTube, Instagram, Facebook, GooglePlus, Twitter, LinkedIn, even Yelp and a few others we have, all of these avenues to get out our message share our journey and we are having the time of our lives. Within each of these social networking platforms, there are sub-communities and through a lot of work (sharing and having fun), we have been able to make some of the greatest connections and make those connections globally mainly because of our unique offering our detailed sharing of watchmaker machinery and tools all coming together to produce this "The Perfected Product" all what we call this journey. We started making YouTube Videos 5 months ago and we started out just sharing once a week, the daily workings of these two best friends working to update their newer shop and the machines and tools within. After decades of making micro-machined parts for others, we begin to get ready to make our product, one we designed on a scratch piece of paper decades ago, a sort of dream to make our own product because at the time, we only made parts for or repaired watches for others until we ended the taking of those jobs a while back. And that is when we began this great YouTube Shop Adventures Journey that is now likely going to expand from within the current YouTube channel. YouTube Channel demand from viewers sparks something new that is being filmed now for our existing channel but will be displayed in a new thumbnail color and a different title from our weekly Shop Adventures series. Nick named pullouts, we know what our first Educational category video for our YouTube channel is going to cover. These are not a weekly release thing, they are an "as required" thing and uploaded when they are accurately completed and should be of the quality to guide the viewer through the details of doing these tasks themselves. Or at least allow the viewer to see these details and step-by-step instruction, even on to major machining or making of our product task as they arise and warrant these fine detailed videos will then be made and shared. Reminder this, for video pullout number 1 is a mini series covering the rebuilding of a Levin Lathe precision headstock spindle and there will be either 4 or 5 videos in this first complete series of instructional information which will start being uploaded in the near future. Other pullout videos will feature the complete reassembly of our Barker AM Series milling machine from start to finish, a series on using a lapping plate and the lapping and polishing compounds and the solutions for micro machined watch and instrument gauge parts. There will be a micro-drill bit series sharing the drills used for micro-machining and horology, and how to make your own drill bits as well as the making of other educational videos surrounding our work based on the viewer input from our YouTube series Shop Adventures. Thank you for following these two best friends Lance and Patrick, on our journey to share our skills and knowledge in the area of design through to micro precision machining and finishing of the components for making "The Perfected Product".